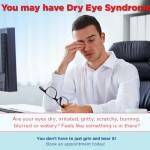 Dry eyes are a common condition that leads many people to seek care and treatment from their local eye doctor. Due to an insufficient tear quantity or quality, the irritating symptoms include redness, stinging and constant blinking or eye rubbing. These symptoms can range from mild to severe, depending upon the individual. Yet, no matter what type of irritation you experience, dry eyes can disrupt your comfortable vision and interfere with daily life. If you suffer from dry eye syndrome, our eye care specialists can help relieve your pain. We will perform a thorough eye exam to diagnose your condition and determine the best dry eye treatment for your condition.